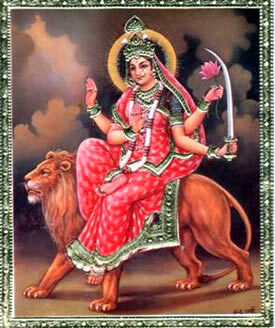 It is usual to speak of the Hindoo Goddess Durga, and yet She is in Truth no more Hindoo than She is Universal. Durga is in fact Sai Vikhë, the Universal Battle-Angel (known in the West by the masculinised and largely de-spiritualised name of Mars). And like all of the High Angels, or Janyati, She is also an Aspect of an even greater Universal – indeed the greatest of all Universals – our sole Creatrix and Saviour: Our Mother God. 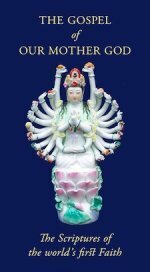 In our main page on the Goddess Durga and in our other video clips about Her, we have examined various aspects of Her thealogy, both as the Vikhelic (Martial) Angel and as Our Mother God. We have shown how She is the Supreme Creatrix Who, in times of disrupted harmony, descends into Her Own creation to set things aright: thus she is the original form of Vishnu and the earthly equivalent of the Herthelan Sai Rayanna. If you have not seen the other video clips, it may be best to start with this one. The one we present on this page is, in a way a summation of the others, featuring a loving chant of devotion: "Durga hai meri ma" combining both Indian rhythms and Western martial rhythms, showing the universality of the Divine Being who is much more than simply the Hindoo Goddess Durga. As in our second video clip about Durga we see the incident in which, having apparently slain the Demon King with Her sword of Truth, each drop of blood he sheds becomes a new Demon King and Our Divine Mother and Protectress is surrounded by her multiple enemy. Being both the omnipotent Creatrix of the Universe and – on another level – the invincible Battle-Angel, Durga defeats all the manifestations of the demon king. In the Devi Mahatmya, the Scriptural source for this fundamental story, Durga, in Her form as Kali, drinks the blood of the defeated demon(s) preventing them from re-spawning. In our commentary on the earlier video clip it was explained how this shows that even in killing her enemies, Our Divine Mother brings them salvation, absorbing them into Her Godhead. In this clip, this is made even more explicit, with Kali absorbing the demon in his entirety. It is also clear that neither blood-drinking nor demon-eating are to be taken on a crude physical level. This clip makes it clear that a magical – or Spiritual – absorption is taking place. The Mother of the Universe descends into Her Creation to restore harmony, and even evil and disharmony are re-absorbed into Her Godhead, just as, in the end, through Her Grace, all beings shall be saved, even to the last blade of grass. Please enjoy this video clip and join all creation in the chant of Durga hai meri ma! This video clip is not, we fear, of the highest quality, and in the area of special effects it is not of the standard of expensive Western films. But it expresses with charming simplicity and innocence the mythic depth of this most fundamental story of our Kali Yuga. Please watch this video clip prayerfully and with faith, letting your heart join in the chant of "Durga hai meri ma"; and you will be filled with the understanding that this is not merely the Hindoo Goddess Durga, but the Universal Angel of Protection and the righting of wrongs: and beyond even that, our one Supreme Mother God. Durga Defeats the Demon Part 1: An exciting video-clip of the battle between light and darkness with commentary on the Oneness, Multiplicity and Trinity of Our Mother God. Durga Chalisa: A beautiful forty-verse hymn to Durga sung on video against a lavish background of Her Divine Feats. With English translation and commentary. The Story of Sai Rayanna: The first Herthelan Empress and warrior-queen is the equivalent of Durga in an all-female society.